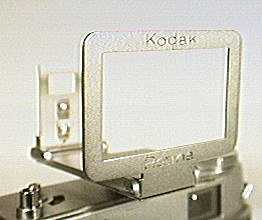 This is the viewfinder used on the Retina IIc and IIIc when one of the auxiliary lenses is fitted. 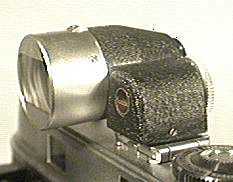 The little wheel adjacent to the eyepiece can be set to the subject distance to compensate for parallax error, the small roller on the top sets the unit to 35mm or 80mm field of view with a rotating mask. An alternative to the optical viewfinder, this unit clips into the accessory shoe to facilitate action shots, as one can "look around" the viewfinder until the moment of the shot, then bring the camera right to the eye to frame exactly. The rear frame slides up and down to provide some parallax compensation, though how practical this would really be is debatable.